Just your average family wearing animal heads standing in a lake around a bleeding coffin, you know. I’ve never been more pleased to learn I’ve arrived late to an ongoing series than in the middle of my first playthrough of gleefully macabre point-and-click adventure Rusty Lake Paradise. Rusty Lake Paradise, released last week on Steam, Google Play and iTunes, tells the story of a man named Jakob, youngest son of the Eilander family, returning home to Paradise Island following the death of his mother. It’s a touching tale of family bonding, with all the common elements one expects from such a story: severed limbs, terrifying mantis creatures, and mind-bending puzzles. Oh, and also Paradise Island has been visited by the Ten Plagues of Egypt. As you do. Okay, maybe Jakob’s is not the most normal family. They’re all he has, so it’s up to him to weather the ten plagues, collecting items and solving puzzles in order to gather his mother’s memories and move on. 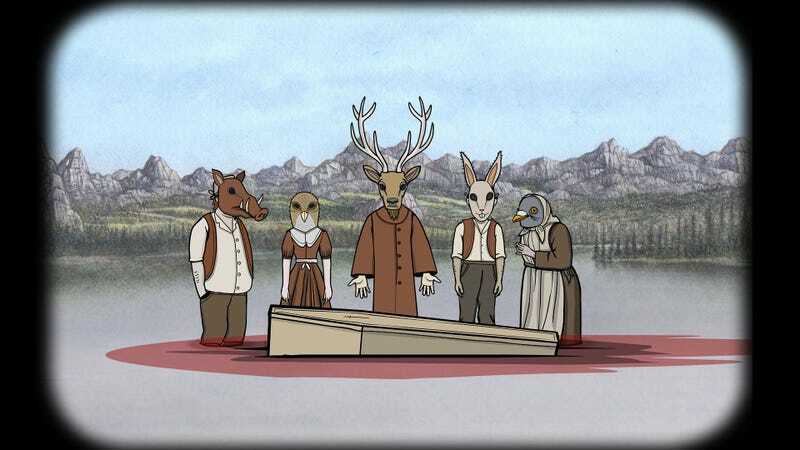 Rusty Lake Paradise features a broad range of puzzles. There’s standard point-and-click fare, like the music-matching sequence using a series of crickets, each chirping in a different tone. Then there’s more convoluted fare, like transforming your brother into a half-man, half-insect creature and using him to murder animals scattered about the island so you can sort through their innards for useful objects. Rusty Lake Paradise is not so much scary as it is unsettling. We’re talking frogs dropping out of people’s mouths, pulling leeches and collecting phlegm from dripping noses, blood dripping from a wounded moon sort of disturbing. If you’re squeamish, you might want to steer clear. And if you’re not squeamish, you’re in for a real treat. Amsterdam-based indie studio Rusty Lake were inspired by Twin Peaks in crafting the series’ tone and world, and that inspiration shows. It feels like a world that’s sort of like ours, but somewhere down the line took a left turn towards freaky. I really dig it. And best of all, once I’ve cleared Rusty Lake Paradise, I’ve got two more Rusty Lake games to play—Rusty Lake Hotel and Rusty Lake: Roots, the first two games in the series. That and Cube Escape, the free companion series that’s available on iTunes, Google Play or in-browser (if you’ve still got Flash). Basically, coming late to Rusty Lake Paradise has opened up a whole new world. A really strange, mildly disturbing world.